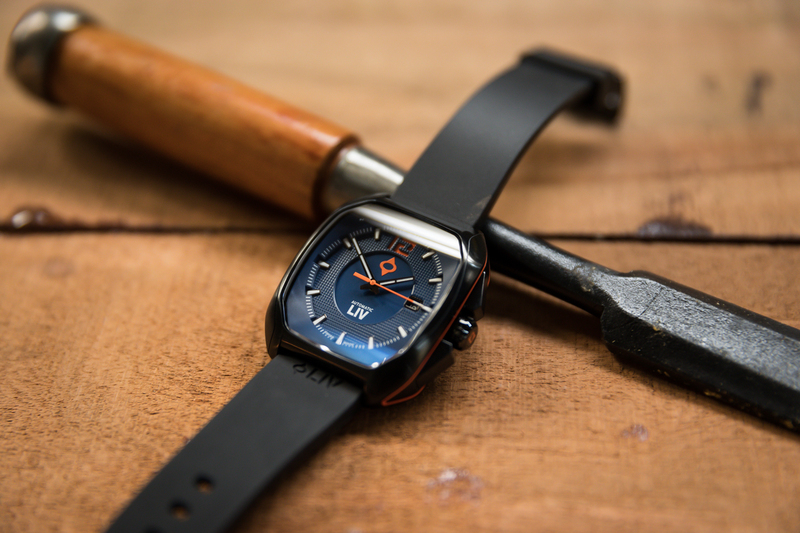 Collecting watches is a thing… Creating your own watches is another. Yet, with recent developments, such as crowd-funding and online shopping, the way watches are created and sold has drastically changed. 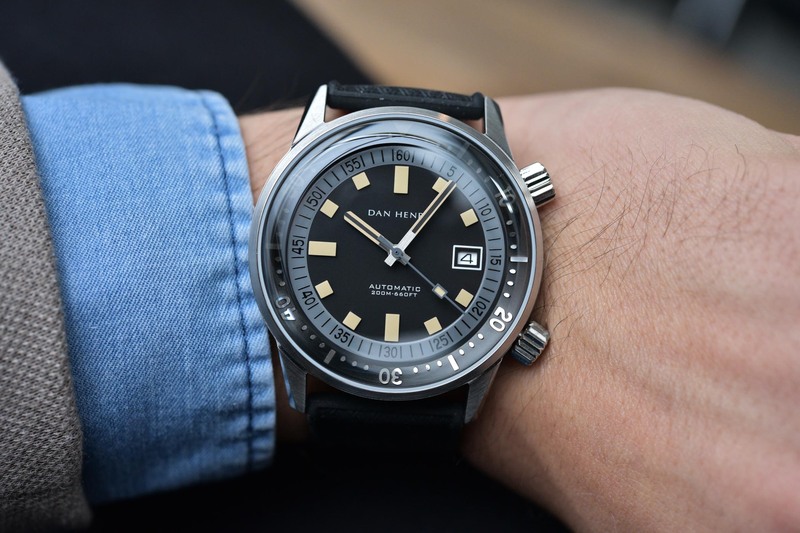 One example is Dan Henry (a watch collector) who turned his passion into a business, by creating vintage-inspired watches with interesting value-for-the-money. 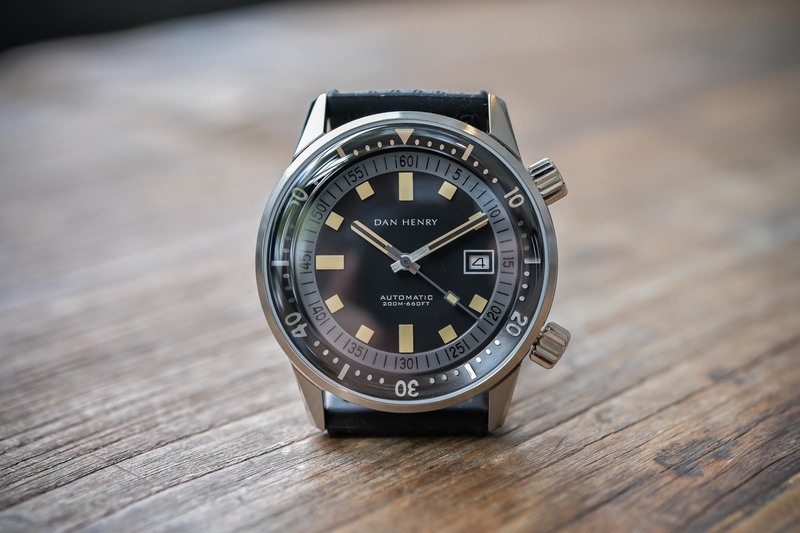 One watch that tickled our interest is the Dan Henry 1970 Automatic Diver Compressor (the only one for the moment with mechanical movement). 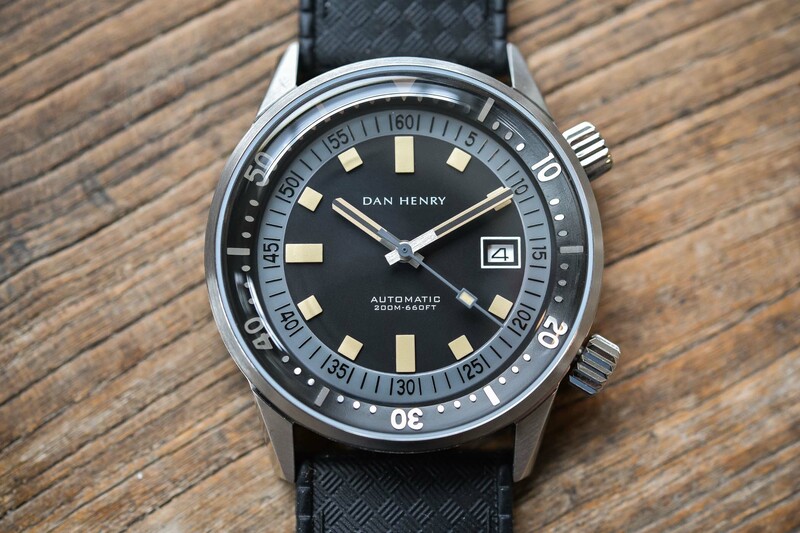 Like all Dan Henry watches, the 1970 model incorporates design elements from its namesake year. 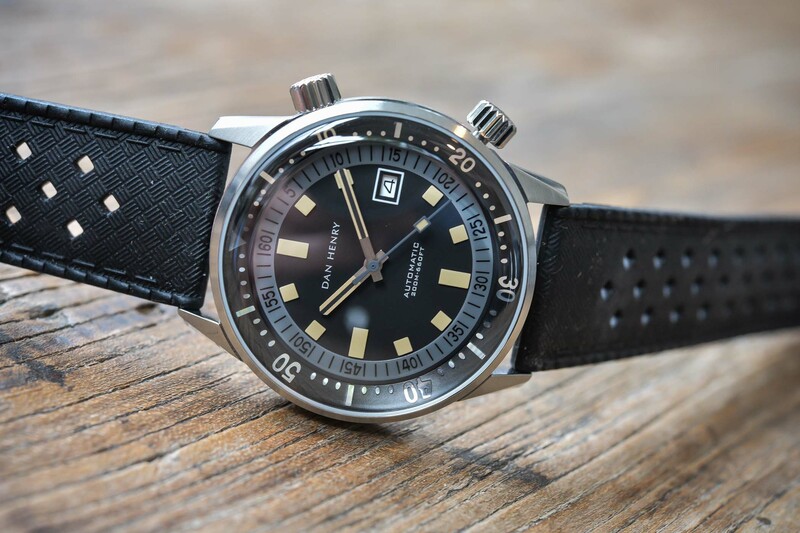 Look past the 1970s styling, however, and you will find plenty more to appreciate about this watch. With a mix of whimsical and high-end features at only US$250, the 1970 also includes a boatload of bang for your buck. 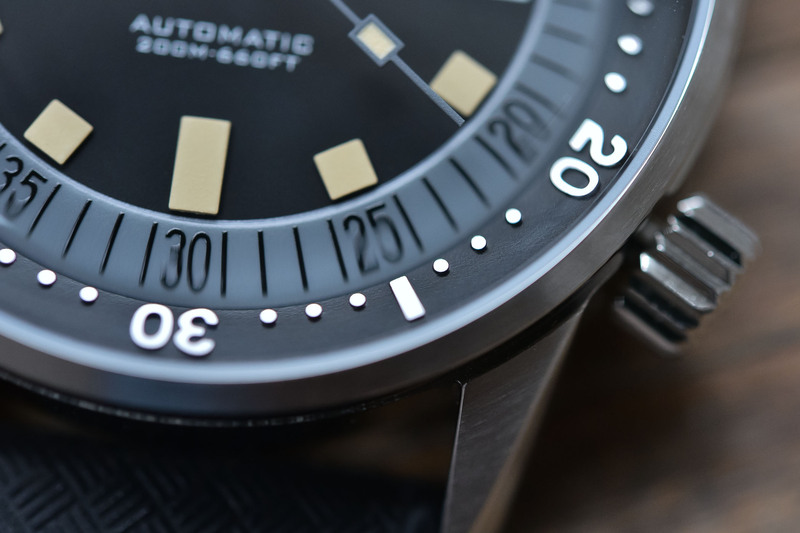 As for functionality, the 2 o’clock crown operates the rotating inner bezel, which functions to time your dives or whatever else you need to be timed. The 4 o’clock crown operates the date and time setting. 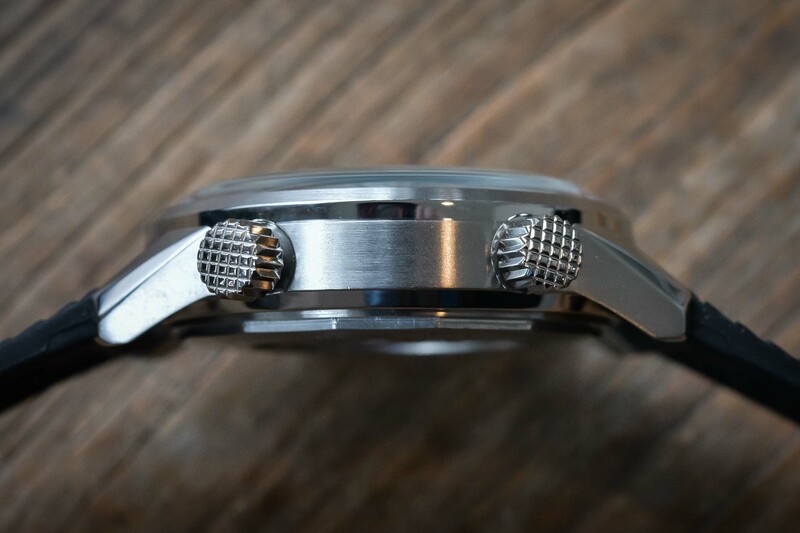 Intricate cross-hatch design on the outer edge of the crowns, very nice details for a watch at this price range. Rated as water resistant to 200 meters, yet the two crowns do not screw down, making me a tad sceptical about just how well it would hold up at great depths. 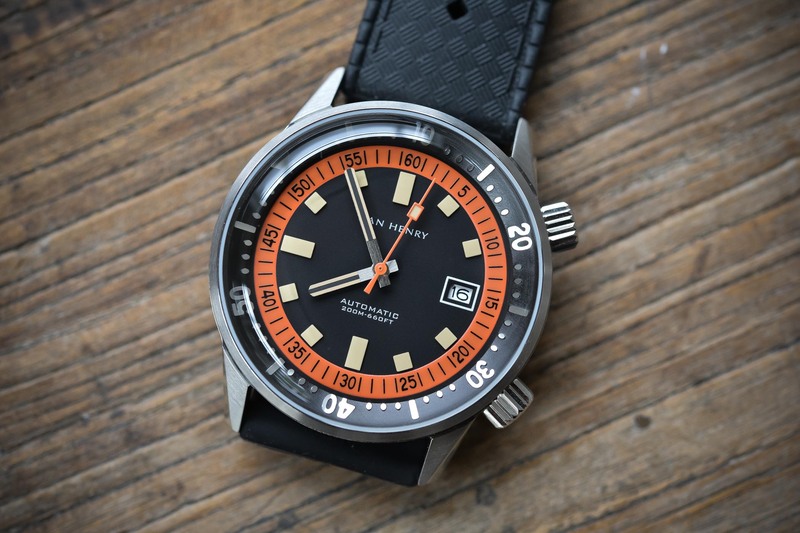 The vintage-inspired dial of the Dan Henry 1970 comes with a choice of either grey or orange on a matte black background. The styling features hints of that funky 1970s vibe without throwing it in your face; there are plenty of modern styling cues here as well. The sapphire crystal has been treated with anti-reflective coating and uses a double domed design for easy viewing of the dial from almost any angle. This super-domed shape gives the watch a nice style, with lots of distortions and reflections, just like vintage Plexiglas-equipped watches. 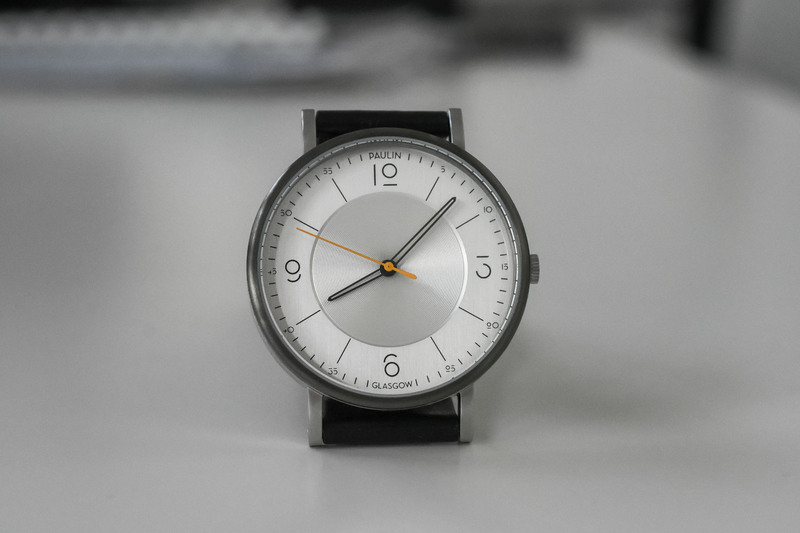 The orange/grey chapter ring displays the minutes and minute markers in black. Bright lume makes the hands, hour markers, and chapter ring easily visible in the dark. The hour and minute hands are a three-striped affair, with a black center line sandwiched between two tan lines. The tan colour is repeated on the blocky hour markers as well as a square block on the second hand. The date display keeps it classy with a modern font and fine tan outline around it. The textured silicone band is wide, at 24 millimetres. While the crosshatch design is a nice touch, recalling 1960s tropic bands, I can’t help but think how much classier this piece would look with a nicer strap (after all, it is just a matter of taste, and changing strap is not that difficult). Several square accent holes sit on either side of the main round holes, providing some nice ventilation. 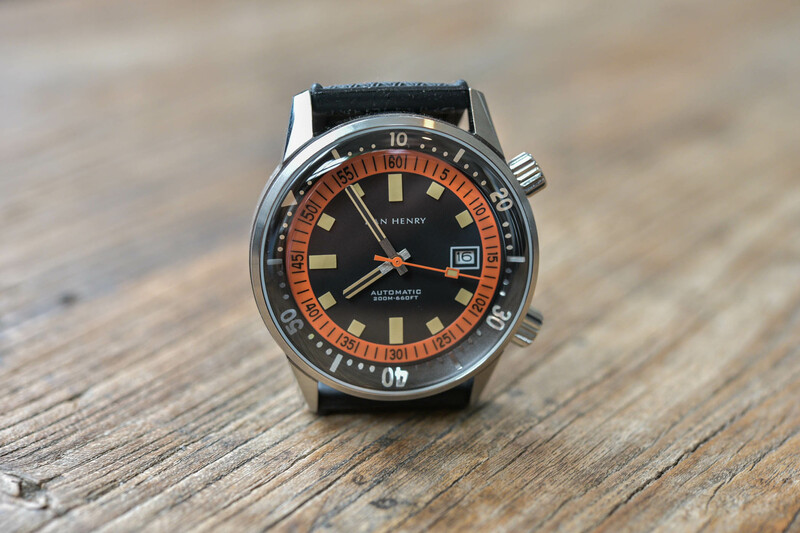 Dan Henry employs Seiko’s NH35 for the 1970’s movement. 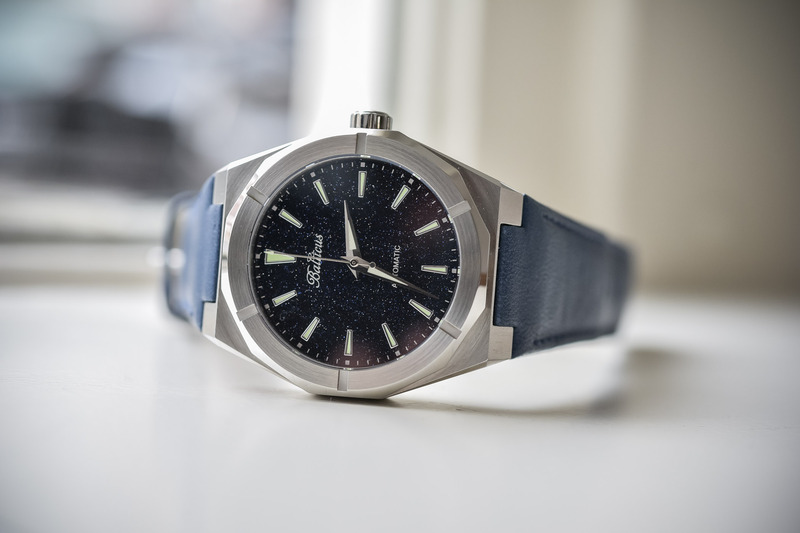 While this is a solid and reliable automatic movement, it is probably the main area that gives away this watch’s relatively inexpensive price as this is a rather blue-collar movement compared to some higher-end units out there. That said, the NH35 punches above its weight, making it the ideal candidate for a cheap yet accurate automatic movement. 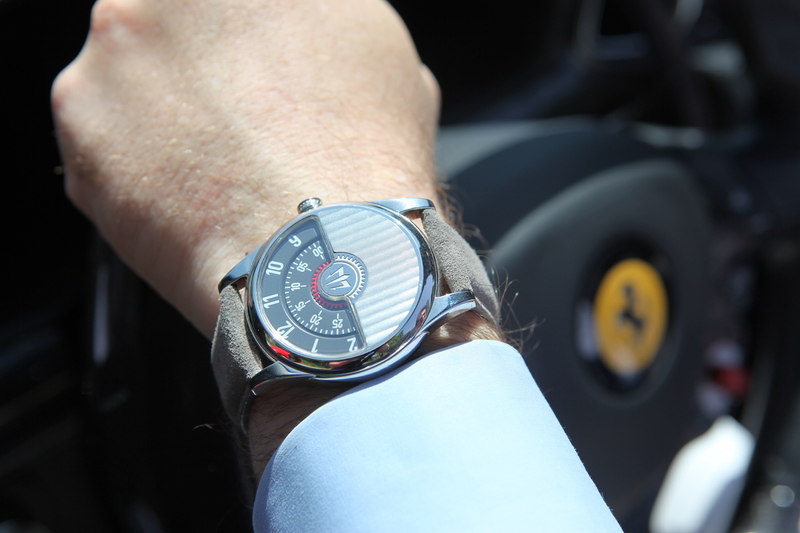 It makes use of 24 jewels, ticks at 3Hz and features a 41-hour power reserve. A known, reliable workhorse that is made to last. 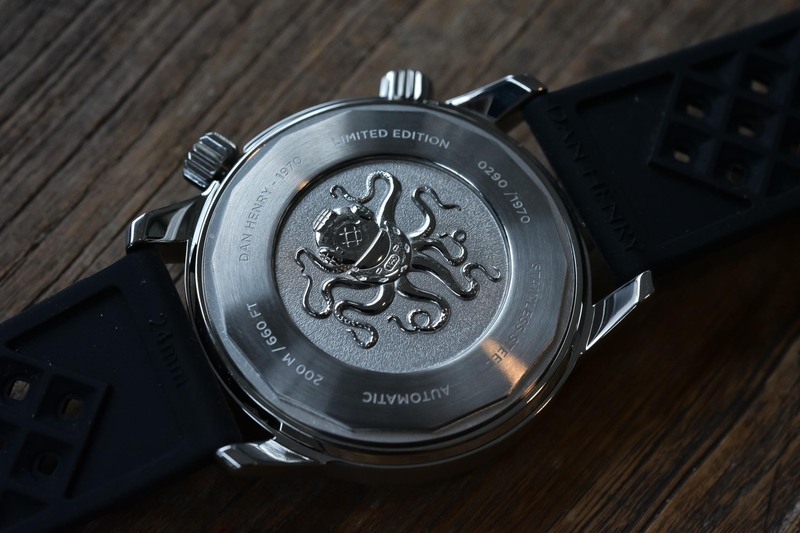 As you might know, Dan Henry only produces a limited number of watches, with the amount produced equal to the model number. This exclusivity only adds to the great value of this timepiece. With so many cool features and fun design elements, the Dan Henry 1970 is an enchanting watch regardless of its price point. 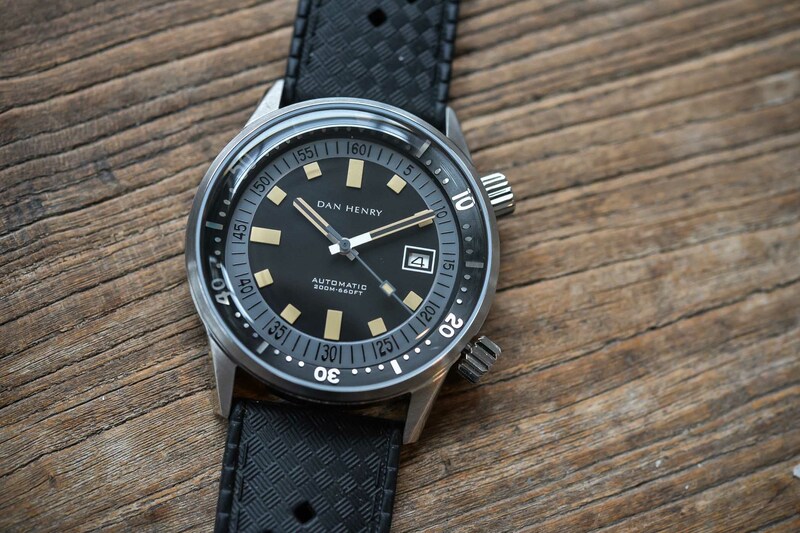 If the large size of this watch is the only thing holding you back, you will be pleased to know that Dan Henry is currently taking pre-orders for a 1970 diver in a 40-millimeter size. 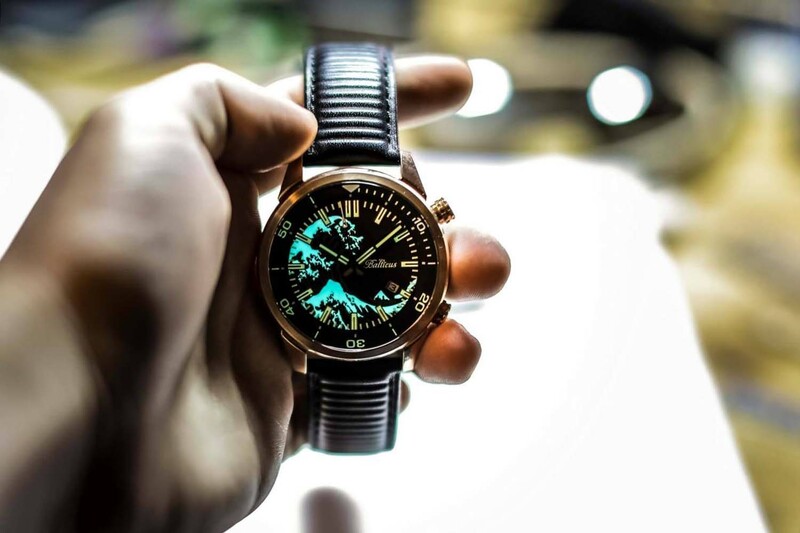 Overall, this is a fun and unique watch that brings an equal amount of style and value to the table. It’s hard to ask for a lot more than that. Limited to 1970 pieces and priced at US$250. More details and orders on danhenrywatches.com. Inexpensive, but very good looking! I think the Seiko movement at $250 is a major positive. Beats the heck out of Miyota that doesn’t hack and has a stuttering second hand (although I’m actually a fan of said Miyota, too). Just ordered one. Love at first sight and no brainer price . I just got my watch a few days ago and love it. I do have one question about changing the date on the watch. It seems the only way I can change the date is to change the time manually by which is very time consuming. Other than the date, I’m very happy to add this watch to my collection. I don’t know but on my 40mm the crown does screw down. The one that rotates the bezel does not, but that just rotates. At least for me, is a great watch for the price paid.